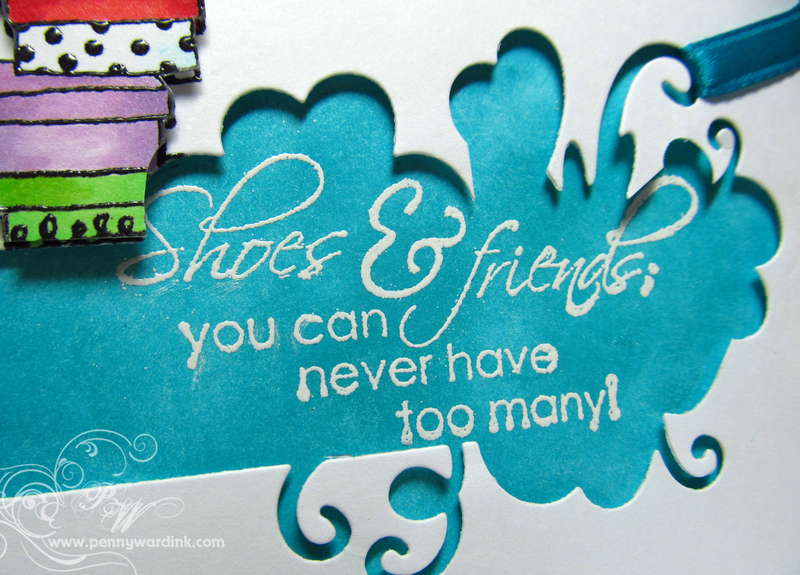 Happy Monday my friends.....Did you see all the new stamps and dies that Penny Black previewed last week? Yes I said "dies"...YAY!!! Super cute and you will want every one of them. Make sure to check out the Penny Black Blog as there will be some very inventive ideas for using the new Creative Dies. In the meantime, how cute is this Shoe Critic (4315K) stamp? (secretly I call them the Skinny Girl stamps)...don't tell anyone. I used the negative of a new die from Spellbinders for the opening where you see the sentiment...there is just something about the curls around the edges that spoke to me (and besides, it was a perfect fit for that extra cute sentiment... Too Many 3853F). Copics for coloring, some ribbon and fussy cutting and I have a great card to send to a friend. 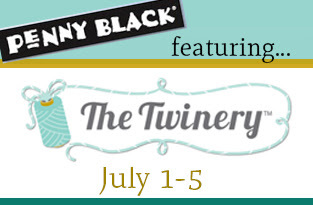 Make sure to follow the Penny Black Blog this week as they pair up with The Twinery. 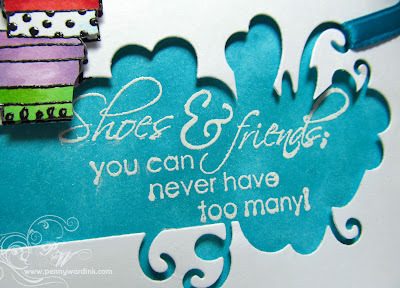 Cute card and a great use of the negative portion of the die. I'll have to check out the new dies from Penny Black. This is fabulous, Penny! The negative of that die makes such a unique spot for the sentiment--love it!